NEW Wine Bar in Ochi by Miss T’s Kitchen! Two Sundays ago, February 25, 2018, Anna-Kay Tomlinson, familiarly known as Miss T, officially opened ‘Di Wine Yaad’ on the same compound as her authentic Jamaican cuisine restaurant, Miss T’s Kitchen. Suga and hubby, Randy passed by last Sunday at about 3:30pm to check out the new spot. I was greeted by cosy rocking chairs on the verandah, perfect for kicking back and sipping some vino. Inside is cosy as well. I loved the décor. It was a tasteful cross between rustic and boho-chic. The server inside was professional, but not hospitable. She answered questions abruptly and did not enquire about our wine preference in order to inform us about what was available for our preferred palate. Wine is only available by the bottle for the time being and the Menu is currently in the making. Of course, Oxtail should be included. Miss T has the reputation for having the best Oxtail on the island, although Crystal Edge in Irish Town by Cafe Blue is stiff competition. Di Wine Yaad already has an Instagram page with a teaser of Crispy Wonton Oxtail and Goat Cheese Ravioli that might be offered to pair with wine in the near future. I will revisit when the Menu is ready! In the mean time, I just ordered the Oxtail Mania Appetizer from Miss T’s Kitchen to munch on before heading back to town. I wasn’t hungry, but was repeatedly warned about its small serving size by the staff. It was indeed small, but did not disappoint. Flavourful, well textured and seasoned Oxtail as usual. Last Saturday at about 5:30pm, Suga indulged in Oxtail and Beans with rice and peas and steamed vegetables for just $630JMD +tx and ~10% service charge, still bringing it to under $800JMD. The Alibi is in the Lee Gore Business Centre, formerly known as Peppers. The decor could use some work such as repainting and new furniture. Also, the high stools by most tables were uncomfortable. However, it was cool without the fans on and was quite a chill, bar environment with big screen tvs for me to take in the races left to run at the ISSA/Grace Kennedy Boys’ and Girls’ Athletics’ Champs. The service was good with the manager overlooking things, costs were reasonable and the quality of the food was good. The serving of cooked vegetables was meagre but that was not the highlight of the dish anyway. That Oxtail was tender to the bone! My other half enjoyed his Oxtail as well and the Red Peas soup he had as a starter. I was feeling adventurous and tried their Alibi’s Hard Lemonade, which was refreshing but still had the presence of the spirits, red rum mostly. Careful ladies, don’t have too much of that one or drink it too fast. It is a creeper. Happy to hit another spot with good local cuisine in Kingston though. Other favourites such as Curried Goat, Stewed Peas (on Wednesdays), Ackee and Corn Pork, Jerked and Bar-B-Q Chicken, Jerked Pork (Fridays) and Saltish & Beans are available as well for under $730JMD +tax and ~10% service charge. For a starter, 2 main dishes and 4 alcoholic beverages to all come under $4000JMD inclusive of tax and service charge, is not that bad at all. Suga endorses The Alibi and will return. All restaurants in the Savoury category in Ocho Rios look like they will be enjoyable. However, it is Evita’s Italian that looks the most impressive and may guarantee more value for money. They have an astounding range of mouth-watering entrees (11!) including Lasagna Bolognese, Seafood or ‘Rastafari’, Salmon Risotto, Lobster and Baby Shrimp Fettuccine and more. 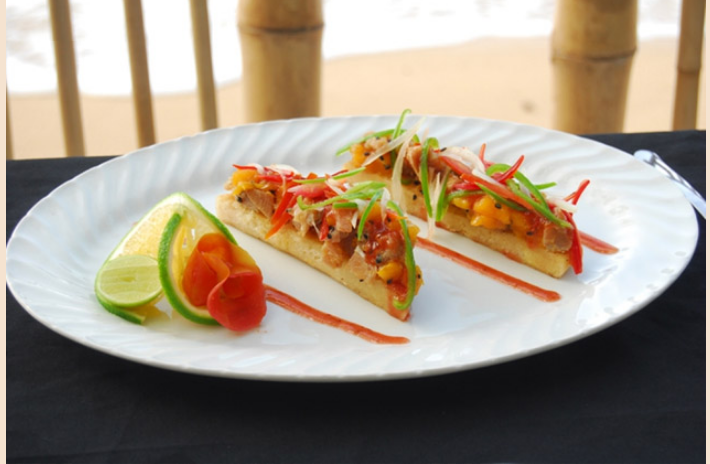 If you feel like taking RW to the beach, Bamboo Beach Club is looking good and interesting with an Oxtail Bruschetta appetizer, a main course of Smoked Pork Chop with Guava spiced rum sauce, escallion curry rice and Rum & Raisin Bread Pudding or Coffee Cheese Cake for dessert. The appetizers at Spring Garden’s Cafe do not look too appetizing, a bit too simple. However, they have some exciting choices for the main course including Seafood Thermidor, Lobster Primavera, Chicken Caprese and more. A warm Bread Pudding with Ice Cream for dessert is usually satisfactory as well. Ochi here comes SuGa Lifestyle! Remember you can visit http://www.go-jamaica.com/rw/ for more information. * Prices of each category includes 1 choice of Appetizer, Main Course and Dessert. Beverages, GCT and Gratuity are additional.